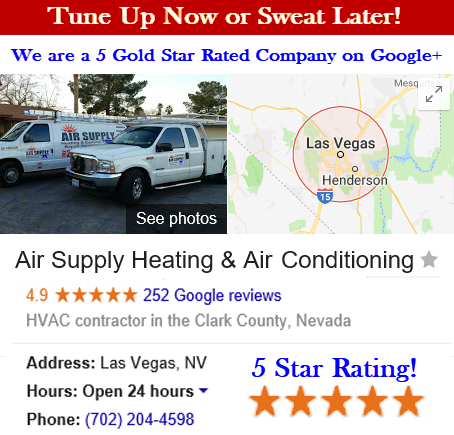 Air Supply Heating and Air Conditioning is completely licensed, certified, and insured to supply the commercial businesses and residential homes of the Greater Las Vegas, Nevada area with our full HVAC System services. 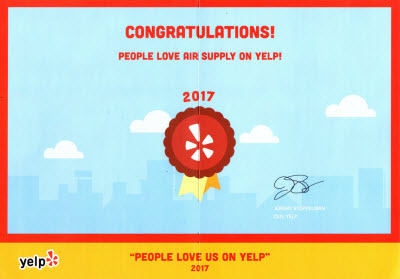 Air Supply Heating and Air Conditioning, since day one has delivered an exceptional experience to our valued customers by applying high moral standards and work ethics, family-friendly customer service, and superior execution on all services rendered. Our technicians have advanced training, experience, and skills that when coupled with the state-of-the-art equipment, tools, and products available only to licensed professionals assures you receive nothing less than maximum results. Air Supply Heating and Air Conditioning of Las Vegas, Nevada take care of our commercial customers by offering them a number of services, including our commercial heating repair service. Few think of Sin City as cold, but during the middle of a cold winter, the bitter cold can be quite unpleasant. If your heating experiences some issues and is improperly functioning or not at all, your customers might end their visit sooner than later and employee morale will be low as well as productivity. Instead of gambling with your heating repair, trust in Air Supply Heating and Air Conditioning to come to the rescue. 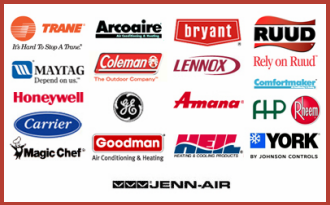 Our technicians know the complexity of commercial heating and can make the needed repairs quickly and efficiently. There is much going on with your commercial heating system. With a number of problems that can go awry, it often takes an inspection and diagnostic tests to assure the proper component is being repaired. The commercial businesses throughout the Las Vegas, Nevada have a handful of more common problems Air Supply Heating and Air Conditioning can repair to get your business running smoothly. – Blower Fan. The heat that is produced cannot be dispersed throughout your commercial space without a sufficiently operating blower fan. In commercial HVAC systems, the blower fan is a relatively large component, comprised of the fan blades, fan motor, belt, and electrical wiring. The blower fan can be inoperable simply due to wear and tear such as; fray or corroded wiring, fan belts becoming loosened or break, or the motor can develop problems rendering the fan blower useless. 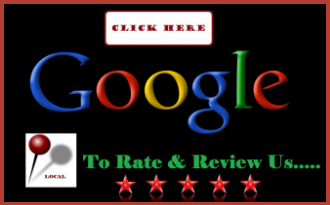 No matter what the case may be, your business’s blower fan in Las Vegas, NV and surrounding areas is repaired by the leading experts in the industry. – Poor Air Ducts. The air ducts are an essential part of your commercial heating system, without their efficiency, the warm air cannot be delivered throughout your Las Vegas, NV commercial building. Whether it is due to poor installation, or just endured some abuse over the years, the air ducts can be leaking the warm air you already paid for to produce, causing excessive utility bills without much payoff. Air Supply Heating and Air Conditioning can ensure your air duct system is up to par and repair the leaks or replace the sections of ductwork. – Faulty Electrical Work. The commercial buildings found across the Greater Las Vegas, Nevada area consume a lot of energy to function, and the heating system contributes to great portion of that. There are but a few areas where the electrical work can cause business or property owners trouble. The biggest culprit is the heating system’s capacitors. The start capacitor and the run capacitor work in tandem to help the motors within the heating system function, if one of the capacitors falls short; it often contributes to additional problems. Air Supply Heating and Air Conditioning can make the necessary electrical repairs as well as any other repairs that might be needed. Air Supply Heating and Air Conditioning of Las Vegas, Nevada is available 24/7 to help your commercial business during a time of an emergency. No matter how big or small the problem is with your commercial heating, we can repair it. Call us today to get started!